Hurlburt Field in Florida is home to USAF Special Operations Command (AFSOC), the USAF Special Operations School (AFSOS) and the 1st Special Operations Wing (1st SOW). Exercise report of the fourth Red Flag of 2008 featuring Indian Su-30MKI Flankers, French Rafales and South-Korean F-15K Slam Eagles. Air show report on the Moscow International Air and Space Salon which was held on August 21-26th at Zhukovsky airfield. Featuring photos and the latest news from the Russian aviation industry. On July 12, 2007, the first Eurofighter Typhoon (AS001) for the first export customer, Austria, was delivered! Helmut reports on Austria's new air defense fighter. Hochgebirgslandekurs Report, Austrian specialized training course for helicopter operations in alpine territory. 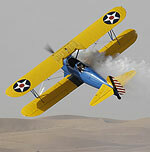 Report of the Al Ain Aerobatics Show held at Al Ain Int'l Airport in January 2006, Abu Dhabi. With photos of the performing aircraft over the desert of the United Arab Emirates.